List Rules Vote up the tricks that make dorm rooms less drab on a budget. The first home away from home for many, a college dorm room is a blank decorating space. It's also usually tiny, decked out with bland furniture, and shared with a roommate. But that just means you have to get creative with interior design and maximizing your space. When it comes to finding effective ways to decorate your dorm room, the internet is full of useful hacks. Ideas range from methods to make a tiny room feel like a real home, to tutorials on how to hide things away. These college dorm room hacks will help you get the most out of your living space for the next school year. Do not waste precious under-the-bed, out-of-the-way storage space. You can make your own bed risers using little more than a drill and a bit of wood. Or, even easier, purchase these bed lifts that not only raise your bed about 7 inches, but also come with power outlets and USB ports. Does this work wonders for a dorm room? Students with an ever-expanding arsenal of electronic devices must figure out how to keep cables, cords, and chargers tidy and organized instead of tangled up in a drawer or snaking around in plain view. One clever and cheap solution is to use empty toilet paper rolls packed in a box. Place the cables or cords neatly inside each roll, then use a sticker or pen to label what's inside each one. A messy desk is a productivity killer if you're continually sifting through piles of clutter to find what you need. 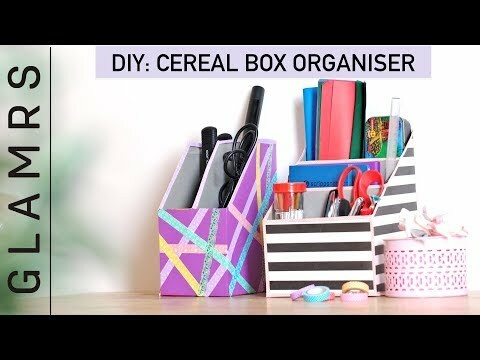 Corral papers, pens, stationery, and other stray items on top of a tiny dorm desk with a lightweight organizer made from empty cereal boxes. Although there's nothing wrong with the Froot Loops or Cheerios look, you can decorate your organizer with colored paper or gift wrap, craftily disguising your breakfast preferences. You'll have a newfound appreciation for dressers after realizing your dorm room probably doesn't have one because they take up so much space. But if you buy a small, low dresser, you can put it in your closet while still leaving room to hang your other clothes.